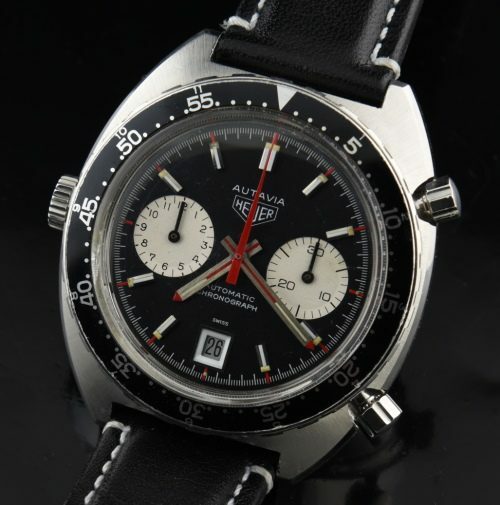 This is a spectacularly preserved 1970’s HEUER AUTAVIA 1163V VICEROY serial 277xxx measuring 43mm. in steel. The case has NOT been polished and looks excellent. The original notched pushers are present. The dial and hands are original and as clean as they come. This buyer of this watch upgraded the bezel to the more desirable MH, which has a more balanced look and provides a better look to the watch overall. The automatic winding caliber 12 movement was meticulously cleaned by our watchmaker and all functions are flawless. It will be hard to find a better and fully serviced example such as this.